Coach's Corner - "Wizard Of Oz" stars multi signed vintage "Over The Rainbow" sheet music piece! Go Back to Lot List "Wizard Of Oz" stars multi signed vintage "Over The Rainbow" sheet music piece! This 9x12 vintage piece of sheet music is the famous song from the 1939 color classic, entitled "Over The Rainbow". It is in EX+ overall condition and comes autographed in GREEN INK by all 7 main stars of the movie, all of whom are now-deceased. 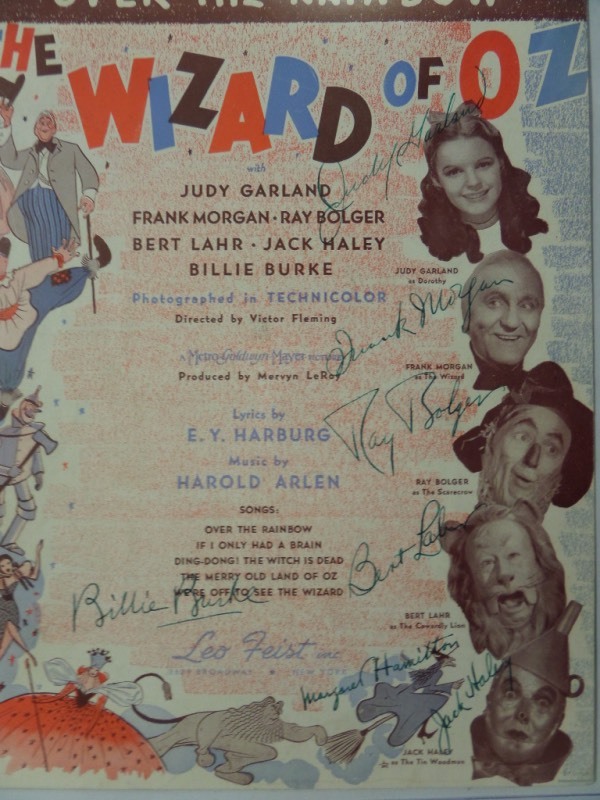 Included are Judy Garland, Frank Morgan, Ray Bolger, Bert Lahr, Billie Burke, Margaret Hamilton and Jack Haley, and with all seven signatures present on this beautiful display item, it values into the low thousands!